The crusty roll, delicious meats and fragrant fresh produce make the bánh mì king of the sandwiches! It’s the perfect cross cultural collaboration brought about by the French colonisation of Vietnam in the late 19th century. Literally translated ‘bánh mì’ means “bread” and signifies the acceptance of bread into the Vietnamese diet following the colonisation. While the bánh mì traditionally was served with just pate, butter and ham, once French occupation ceased in 1954 the bánh mì as we know it today was born with the Vietnamese adding their own incredible fresh flavours to the sandwich. The popularity of the sandwich soared after that and it became known all over the world. Australia has a large Vietnamese population, so we luckily have access to a slew of incredible bánh mì sandwiches at our doorstep. It is the number one sandwich choice for Scotty so we find ourselves popping in to pick one up at our local Vietnamese bakery regularly. This means that I’ve eaten a lot of them before recreating my own special version for you to make at home (surely that makes me qualified right?). Traditionally, bánh mì have thin slices of a variety of meats with layers of fresh and pickled vegetables topped off with chilli and coriander for punch. With mine, I wanted to create a hybrid steak sandwich bánh mì as I was in the mood for both! I used sirloin steaks and marinated them in a traditional nước chấm (dipping sauce) found in Vietnamese cuisine. You know it as a Vietnamese spring roll dipping sauce, but it is quite possibly the most versatile dipping sauce known to human kind. In Vietnam they use it for all sorts of dishes, as well as marinades. It is a comibnation of sugar, rice vinegar, fish sauce and water with finely chopped chilli and garlic – and it is a lesson in the perfection of balanced flavours (which the Vietnamese do so well). The resulting steak, which is grilled after a quick stint in the marinade, is simply wonderful and could be eaten as is with a side salad. Do yourself a favour though, make my quick pickled carrots (which will take the same amount of time as the steak to marinate) and layer up one of these bánh mì bad boys… you will not be dissapointed. To prepare the marinade, combine brown sugar and vinegar in a bowl and stir till sugar is dissolved. Add the fish sauce, water, chilli and garlic and stir till well combined. Place the sirloin steaks in a shallow bowl and top with the marinade until submerged. Set aside in the fridge for 1 hour. To prepare the quick pickled carrots, use a vegetable peeler and run it down the length of the carrot to shave off long ribbons and place in a clean jar. Combine the remaining ingredients together in a measuring jug and stir well to combine. Pour the pickle mixture into the jar with the carrot ribbons, seal and set aside for 1 hour. Once the steak has marinated and the carrots have pickled for an hour, heat a cast iron grill pan over medium high heat. Remove the steaks from the marinade, place in the pan and cook for four minutes. Turn the steaks over and cook for another four minutes, then remove from the pan, wrap in aluminium foil and leave to rest for a 4 minutes (timing is for a medium rare steak). Once rested, thinly slice across the grain. To layer your Bánh mì, begin by combining the Kewpie and Sriracha to make a chilli mayo and spread it on the bottom of a cut vietnamese roll. Top with thinly sliced sirloin steak and ribbons of cucumber. Add ribbons of pickled carrot, a spring onion, coriander leaves and slices of fresh chilli. Repeat layering with remaining rolls and serve. All produce used above was from Westfield Hornsby’s Fresh Food Market. Check out their cooking competition at westfield.com.au/Hornsby/events. 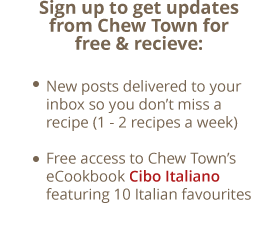 Amanda Michetti was paid to develop this recipe external to Chew Town for Westfield, and was given permission to post the recipe here on Chew Town. To read Chew Town’s disclosure policy please visit the About page. The gorgeous Preserve Jars featured in this post with the pickled carrots are from Kilner Jars with thanks. Thesis a stunner, really. Your pickled carrots and how you sliced them into ribbons is genious, so perfect for a sandwich instead of a julienne like in salads. Gotta try this one and grill up these steaks this weekend. I have been on a sandwich making bing as of late, but I’m sure Dave will devour these, too. Have a great weekend Amanda. Pickled carrot ribbons are definitely a favourite of mine, it seems to pickle beautifully while still retaining crunch. I’m a massive fan of sandwiches… but never seem to post them on Chew Town. I think its about time I change that! Have an amazing time in Hawaii Kevin! Gorgeous, Amanda. I have one of these at least once a week. Never make them, though, as I’m always getting them from Hunter Connection in town. I’ll be missing my banh mi when we leave the country! They are so delicious Bel!! I’m definitely finding excuses to put them in everything. These photos are gorgeous! And now I feel like I’m a Vietnamese sandwich expert 😉 .. ok not really but I know more than I did. Looks delicious!!! I’m embarrassed to say, I have never eaten or made a banh mi. I know, I know. I must remedy this immediately-starting with this recipe! DELISH! These look so delish!! I cant wait to make these! And your pictures…wow! Great job on selling your food through your photography! I am hanging out for the new Vietnamese cafe to open around the corner as I know they will have bahn mi on the menu. At the moment it is a major effort to find a good one. And after reading this I am desperately craving them 😀 Looks sensational. I absolutely love love love Banh mi’s – these look incredible. Love how you’ve styled them. Mmm, love this sandwich! Haven’t had one in ages, and yours is making me SO hungry! And I love those carrots! I think for summer I would need to take this a little further and BBQ the steaks, then get the tribe to self assemble their dinner! They look delicious Amanda.